Afternoon Loverlies!! Well yesterday I went to my Mother in laws house. My anxiety wasn't too extreme. YAY!! I had a good time also!! :) So glad, that helped my Christmas spirit a bit. I have one more Christmas to go to. I can't wait either!! It's gonna be breakfast foods!!! Example: Chocolate gravy and biscuits!!! I forgot what the other choices are, but I like them. ;) Today I feel a bit down in the dumps it just hit me a minute ago. ARGH!!! *shakes fist at her brain* GET IT TOGETHER, I MEAN, COME ON NOW!! Therefore I am writing a blog post, reading a book, and finding active stuff to distract myself from these sad thoughts/feelings. I think I can do it. Today is Learn MORE About ME Monday! 1.) Here's another odd thing you may not know, I used to put cool whip on sandwich bread and eat it. 2.) I think Paramore is easy to listen to and fall in love with all their songs. Because of Hayleys' voice, it is just simple, smooth, and different. I love it! I love all types of music. I'm not that fond of techno, screamo, electro (I think that's how you say it), some rap. Yep. 3.) I wish I could paint. That is one creative thing I don't have, also craft making, sewing, crocheting, you name it. I can make some things, but a lot of items I see it perfectly made in my head. Then I attempt to create it and it comes out like a wad of poop. 5.) I have always wondered if I would look good with pale/Ice blond hair. I am too scared to try it though. lol Maybe someday I will attempt it. 6.) Abba, a lot of times, makes me happy. :D It just is an easy mood lifter most the time. Makes me feel so happy all over. Also Hey Jude, I love that song. 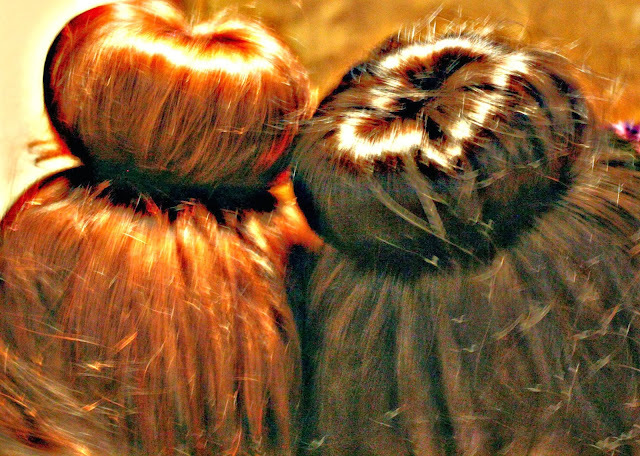 Mine and my Sissys' Bunheads! !